Since the Hawthorne Bridge is the center of the Pub Night universe, it's about time I got around to writing about the Pilsner Room, the taproom for Full Sail's Portland brewery. 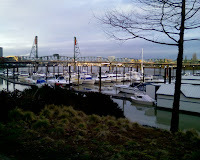 After all, you can see the bridge from there, and it's a nice destination if you're on a bicycle, with easy access from Waterfront Park (which also means it's within stumbling distance of the Oregon Brewers Festival). I practically lived there last October because of brewer John Harris' magnificent Lupulin Fresh Hop Ale. So I'll take advantage of writing up Thursday night's tasting of barrel-aged porters and stouts to extol the virtues of the Pilsner Room. The McCormick and Schmick's restaurant attached to the Pilsner Room provides a menu that's better than the usual pub fare, with good prices at lunch and super-cheap ones at happy hour. There are lots of 2- and 4-seat dining tables -- even more outside in good weather -- and plenty of room at the bar if you're on a solo mission or you just need to be close to the beer. The selection is fabulous: about 10 house brews, 3 cask engines, and another 10 guest taps. Besides the mainstream Full Sail repertoire -- and excellent seasonals like the Slipknot IPA -- there are always three or four rarities from the adjoining brewery, like the doppelbock, or the delicious Belgian dubbel. The guest taps are nicely done, with an interesting variety of quality beers. 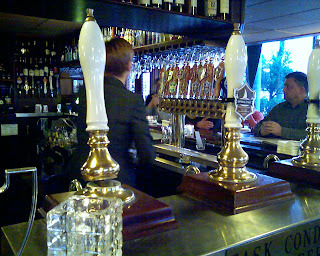 It always makes me happy to see an out-of-the-ordinary Hale's on tap -- it's the Wee Heavy right now. It's also sporting of them to always keep one of the engines stocked with a guest cask: a Double Mountain Red Ale was on cask Thursday, and I've seen Hopworks and (I think) Ninkasi casks. Now, about those dark beers. Each year, the brewery takes a portion of their Top Sail Imperial Porter or Black Gold Imperial Stout, whichever they brewed that year, and ages it in bourbon barrels for nine or ten months. Thursday evening they trotted out three different examples: this year's aged Top Sail, a Black Gold from 2006, and a pre-Top Sail Imperial Porter from 2004. The year refers to when they were taken out of the oak, they were brewed the year before. I don't know who started this scheme of aging stouts in bourbon casks, but it seems to be growing in popularity. My first encounter with it was a bourbon-aged KGB Stout that I had at Widmer's Gasthaus sometime in 2004. This year they're breaking out all over. John Foyston, the beer writer at the Oregonian, pointed out four different barrel-aged releases -- some stouts, some barleywines, some in whiskey barrels, some in wine -- in the space of a couple of weeks. And of course there's Epic and the infamous Abyss. Many of these are blends of aged and fresh beer. As far as I can tell from the Full Sail propaganda, the ones we had Thursday are just the straight-up aged item. The usual Pub Nighters couldn't make the Full Sail matinee, so I was left on my own for this tasting. Fortunately, there was a friendly and sophisticated crowd sitting at the bar to ooh and ahh over the beers with. These were luscious, tasty brews. The 2004 porter tasted strongly of bourbon -- which could have turned out badly, but didn't. It also had a very strong chocolate taste, again, in a good way. The literature says it's 7.4% ABV; it tasted stronger than that to me, comparable to the 10% of the other two beers. I was pretty sure this was my favorite of the three, but the 2006 stout kept growing on me until I thought maybe that was my favorite. The 2006 was smooth and delicious, with that hint of minty flavor that so many good stouts have. Though the bourbon flavor wasn't as pronounced as with the 2004, it did add a nice touch to a very well-rounded beer. You can't really fault the 2008 porter for coming in third place to its accomplished older siblings. The flavor seemed milder than that of the 2004, and its lighter body made me think "cola". Still a mighty fine porter; I'm going to leave my bottle of it in the fridge for a while to see how it develops.